12/22/2008 - Requirements for labeling products that contain a nitrate or nitrite. Title: 12/22/2008 - Requirements for labeling products that contain a nitrate or nitrite. This is in response to your e-mail correspondence to the Occupational Safety and Health Administration (OSHA). Your inquiry has been transferred to OSHA's Directorate of Enforcement Programs for response. This letter constitutes OSHA's interpretation of only the requirements discussed and may not be applicable to any questions not delineated within your original correspondence. Your letter requested clarification regarding OSHA's hazard communication standard (HCS), 29 CFR 1910.1200. You specifically asked about the requirements for labeling products that contain a nitrate or nitrite. Your scenario and questions have been paraphrased below, followed by OSHA's response. Scenario: You indicate that the International Agency for Research on Cancer (IARC) will soon be classifying nitrate and nitrate (ingested) as a Group 2A, probable human carcinogen. Your client manufactures an ink product that contains 0.1% (or more) of nitrate by weight. The ink product is encased in cartridges that are designed to prevent leakage and it is not likely that any individual would be exposed to the ink via ingestion or any other route of exposure. Question: Must a product, like that of your client, containing 0.1% nitrate be labeled as a carcinogen under 29 CFR 1910.1200(f)(1)(i). ...IARC published Monograph No. 44, entitled, "Alcohol Drinking," in which the carcinogenicity of ethanol was determined based on chronic exposure to ethanol through human consumption. Manufacturers and importers must consider this information in performing the hazard determination of a product which contains ethanol. The MSDS would have to list ethanol as a hazardous ingredient along with the findings published in the IARC monograph. However, under normal conditions of use or in a foreseeable emergency, ingestion should not be a route of exposure; therefore, the product would not be listed as a carcinogen on the label. Therefore, if ingestion is the only route of exposure by which the nitrate/nitrite is capable of demonstrating its carcinogenic properties, and there is never a time where it is expected that the nitrate in your client's product would be ingested, then the IARC Group 2A classification would not be required to be on the cartridge label. However, the cancer hazards would still be required by the HCS to be listed on the material safety data sheet (MSDS) for the ink product. If your client demonstrates that their ink cartridge is a consumer product, as defined in the standard, then the HCS would not apply. Please remember however, that there are other agencies and entities that have standards and regulations for labeling. At a minimum, the Consumer Products Safety Commission (CPSC) and the Department of Transportation (DOT) should be contacted to ensure that their standards are followed by your client. Thank you for your interest in occupational safety and health. We hope you find this information helpful. OSHA requirements are set by statute, standards, and regulations. Our interpretation letters explain these requirements and how they apply to particular circumstances, but they cannot create additional employer obligations. This letter constitutes OSHA's interpretation of the requirements discussed. Note that our enforcement guidance may be affected by changes to OSHA rules. Also, from time to time we update our guidance in response to new information. To keep appraised of such developments, you can consult OSHA's website at http://www.osha.gov. 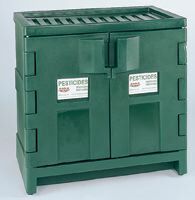 Get pesticide cabinets and flammable storage cabinets at Safety Emporium.